The Center City Rack in front of Express at Liberty Place went in at 10AM this morning at the height of the Nor'Easter. Andy Dyson from NBW arrives at 16th and Chestnut with the bike rack in tow on his custom bike trailer, while Russell Meddin looks on. Thanks to Andy Dyson, John Dowlin Sarah Clark Stuart and Russell Meddin for supplying time and sweat equity. And let's not forget our friends at the Streets Department granting the necessary permits. So I know NBW uses a wheelbender rack when it does guarded even parking but what exactly are they doing with it here? I'm not so sure I'd use the wheelbender if it was left unattended. I love the idea but I just have some concerns about the details of execution. Also I hope that Café Spice EXPRESS had something to do with this because according to The Shops at Liberty Place, the only way you are going to get to their establishment is by car despite being less than a five minute walk from 3 rail transit systems! Buy don't fret! Their 4 story parking garage is "complete with soft music and seasonal artwork on each level." Need I say more. Correction "So I know NBW uses a wheelbender rack when it does guarded EVENT parking but what exactly are they doing with it here?" The racks are temporary, like the parking space. 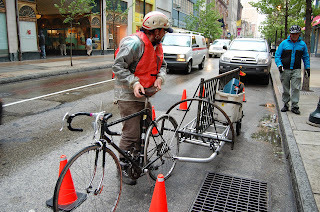 Permanent on-street bike spaces will use the inverted gang U-Racks.